Centre approves State’s proposal for electronics cluster in Chittoor district. The Union Ministry of Electronics and Information Technology has approved the State government’s proposal to set up a Greenfield Electronics Manufacturing Cluster (EMC) at Vikruthamala village in Chittoor district. The EMC will be developed over 501.40 acre at a cost of ₹339.80 crore. The proposed EMC is expected to generate nearly one lakh jobs. 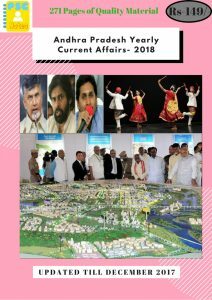 The Andhra Pradesh Information Technology, Electronics and Communications Department has received the confirmation letter from the Central government. The project is strategically located in the State bordering Karnataka and Tamil Nadu, which together account for major share of electronic production in the country. For example, Sripermbudur in T.N., an electronic cluster, is around two and half hours by road from the site. NASA’s Hubble detects Exoplanet with glowing water atmosphere. NASA’s Hubble Space Telescope discovered the strongest evidence to date for the stratosphere on a planet outside our solar system, WASP-121b. The stratosphere is a layer of atmosphere in which temperature increases with higher altitudes. The discovery was made by an International team of researchers led by the University of Exeter by observing glowing water molecules in WASP-121b’s atmosphere. 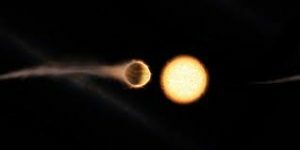 The WASP-121b exoplanet is gas giant commonly referred to as a ‘hot Jupiter’. It has 1.2 times greater mass and 1.9 times greater radius than Jupiter. Around 750 projects awaiting environmental clearance: Government. A total of 741 proposals are awaiting environmental clearance of which 194 are from Maharashtra. 95 proposals from Gujarat and 86 from Uttar Pradesh were awaiting environmental clearance. The Environment ministry has taken various steps to speed up the process of disposing the applications for environmental clearance. They include dedicated online portal for effective monitoring, standardisation of terms of reference for preparation of EIA reports and the Environment Management Plan, exemption from public consultations to certain projects, streamlining the procedure among others. Gk bit – The proposals for forest clearances under the provisions of the Forest (Conservation) Act, 1980, for diversion of forest lands, for non-forestry use are considered in the Ministry and is accorded in two stages. Environment ministry is on stage I or in principle approval, which mandates conditions to be complied with for the issue of the subsequent stage II or final approval, which is the prior approval of the central government. Vijender won the WBO Oriental Super Middleweight title. Indian Professional boxer Vijender Singh won the World Boxing Organization(WBO) Oriental Super Middleweight title. He defeated Zulpikar Maimaitiali of China. It was his ninth successive win in his Professional career. National Handloom Day is observed on 7th August. The National Handloom Dayis being observed on 7 August every year to honor the handloom weavers in the country. It is the third edition of the National Handloom Day after it was instituted in 2015. Handloom sector contributes to nearly 15% of the cloth production in the country and also contributes to the country’s export earnings to 95 %. Aparna appointed as Executive Director of World Bank. The Appointments Committee of the Cabinet (ACC) appointed senior IAS officer from Gujarat S. Aparna as Executive Director of the World Bank. She replaces Subhash Garg who was recently appointed as Economic Affairs Secretary, Union Ministry of Finance. At the World Bank, she will represent the constituency of India, Bangladesh, Bhutan and Sri Lanka for three years. World Bank is one of five institutions created at the Breton Woods Conference in 1944. It is part of the United Nations system, but its governance structure is different. Its headquarter is situated at Washington DC. World Bank provides loans to developing countries for capital programmes. WorldBank provides loans to developing countries for capital programmes. World Bank comprises only two institutions viz. The International Bank for Reconstruction and Development (IBRD) and International Development Association (IDA). In contrast, World Bank Group comprises three more viz. Multilateral Investment Guarantee Agency (MIGA), International Finance Corporation (IFC) and International Centre for Settlement of Investment Disputes (ICSID). Budgetary deficit – Revenue, Primary and Fiscal.